The pinata wasn’t for sale, but lots of people spontaneously offered to buy it–or pay for a whack. Lots of folks wanted to have a shot at the piñata right then and there immediately. But mostly, the pinata brought out a general sense of joy. 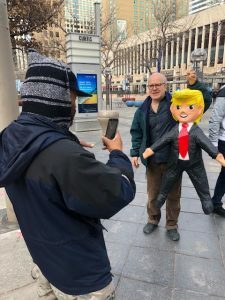 No Trump fans emerged, but if you search for info on Trump pinatas, you find that they’ve been really controversial sometimes (e.g., at a Colorado high school last year, where classes were canceled, and a teacher got death threats after students were allowed to ravage a Trump pinata). On the mall, one woman admitted she didn’t like the idea of hitting a presidential piñata, but she was okay with the Trump pinata anyway. To be fair, I really should walk the piñata down main street Sterling or Greeley. Or take a field trip to a red state–and see what the reaction is. 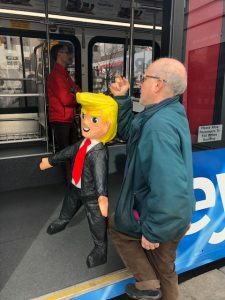 Maybe there’s a book there, Travels with a Trump Piñata. But I have a feeling that once I left the warm blue waters of Denver’s 16th Street Mall, I’d end up being the piñata. And I’d deserve it. That was funny! Jason, you made my lady and me laugh until we cried…or, as they say on the interwebz…ROTFLMAO! This is also good for some laughs – it turns out that Yammypants has been playing an invisible accordion all this time. It explains his bizarro hand movements. But it did really piss off my Trump supporter relatives when I posted it on FB. Back in W's days, I went to a carnival in Sevilla, Spain. There was a booth where you could throw small shoes at Bush's image going back and forth (like the shoes thrown at him during an Iraq press conference). I think I could have made a fortune if I had brought it back to the States!